Home & Small Business: Learn more about how Access Computing can help you go to the next level with networking! If having one PC is good, having two PCs is better, right? That's true in theory, but having two or more PCs in one home can raise more questions than answers. Who gets to surf the Web and when? Which PC gets use of the printer? You can solve these problems--and make your PCs much more useful overall--by networking them. Once you do, you can swap files, share printers, and even use one modem, one phone line, and one Internet service provider account to give the whole family simultaneous access to the Internet. Dad's crunching spreadsheet numbers on his PC upstairs. Mom's writing a grant proposal on her machine downstairs. Junior's browsing the Internet in his room. But what happens if Dad wants to get on the Net, or if Mom wants to use the color printer that's attached to Junior's computer? This family needs a home network. With a network in place, everyone in the house can share printers and files without shuffling floppy disks or a Zip drive. The most attractive feature: Your entire family can share a single Internet connection and surf at the same time. Sounds great, but installing a wired network can be a pain. If all the PCs are in the same room, you can hide the ugly ethernet cables behind the furniture. Usually, though, the PCs are in different parts of the house, forcing you to drill holes in the walls for stringing cables through and to connect other pieces such as faceplates and hubs. You must also decipher arcane network settings in Windows. Fortunately, some networking alternatives don't need ethernet cables. These solutions make it much easier to connect all the computers in your home without punching through the walls. Home networking kits come in three versions besides the traditional ethernet-based design. Phone-line networks use your home's existing telephone wiring--without interfering with phone calls (they operate at a higher frequency than telephones do). Power-line networks operate across the same wires and outlets that your appliances use, but they suffer from poor performance and are not considered further here. Wireless networks use radio waves and require no physical connections. All three types of kits have been available for a couple of years, but they've been plagued by slow speed, high cost, or both. The latest home networking kits tout speeds of 10 or 11 megabits per second (mbps), substantially faster than the older 1- and 2-mbps products. The new specs equal those of a conventional 10Base-T ethernet network. That kind of bandwidth lets you listen to MP3 audio files located on another computer on the network. It also allows you to do several network-challenging tasks at once. For example, you can print a file to a printer connected to another computer, copy a file from a third PC, and download a file from the Internet--all at the same time. Multitasking finally hits the home market. Falling prices are another inducement to set up a network. Phone-line adapters cost $70 to $80 each--more than conventional ethernet cards--but they obviate the need for an expensive hub, which ethernet networks require. Wireless networks cost as much as $180 per computer still, but their price should drop this summer as more kits arrive. This technology is based on the Institute of Electrical and Electronic Engineers (IEEE) 802.3 standard, which has undergone many revisions since its conception to enable interoperability between many manufacturers. Copper-pair or coaxial-based transport systems are bidirectional, typically have a high degree of reliability, and are thus widespread among businesses as the standard choice for networking office PCs and printers. They require the use of bulky Category 5 (CAT5) cabling, and are typically expensive to install. Some home networks have Ethernet, but because of its expense and difficulty to install, few have chosen to use it. This technology uses the existing phone wiring found in most homes today. In some cases, CAT3 wire elements transport at a date rate of 1 Mbps, and many speculate that it will support up to 10 Mbps in the near future. This technology claims to work simultaneously with regular phone service, without attracting the user's notice. The Home Phone Network Alliance (HomePNA) is one organization dedicated to the development of standards and specifications for interoperable, home-networked devices that use existing twisted-pair phone wiring. Although solid progress has been made toward enhancing the usefulness of this embedded asset, inflexibility and capacity limitations will limit its success. A typical home does not contain many RJ-11 jacks; they are rarely in every room or in the location where access by additional phones, computers, and other devices is required. In addition, selection of signal characteristics for data transport over this medium is critical to resist interference from other shared devices. These devices include answering machines, fax machines, modems, telephone sets, and other data-transport devices such as the integrated services digital network (ISDN) and digital subscriber line (xDSL) equipment that use the twisted pair simultaneously. AviatorPRO Wireless Networking provides high-performance local area networking technology for today's Windows 95, 98, NT 4.0 and 2000 PC users. 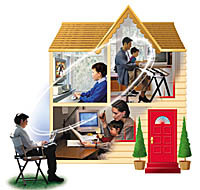 By utilizing internationally accepted 2.4GHz spread-spectrum radio frequency technology (RF), AviatorPRO Wireless Networking reliably connects computers together through walls, floors and ceilings without having to install networking wires and quickly enables the sharing of an Internet connection, printer and files between multiple PC users. AviatorPRO is ideal for both home and office use. Ready to go wireless? How would you like to share printers, files, internet, calendars, e-mail and much more? Access Computing can set up a mini-network with all these options right at your fingertips. We can do it with or without wire! A network that is reliable and sets up in less than 15 minutes! Roam anywhere and stay connected throughout offices, campuses, etc. Ethernet Quality Performance!� - Contact Access Computing if you are ready to go with a wireless or a mini ethernet network. Click here for more details on our wireless connection (Will need Powerpoint to view)! Shared Internet access means, simply, that you only need one Internet account for all of your computers &emdash; you can share the one Internet access account with every computer in office or home. Access Computing can help with determining the Internet Service Provider for your purposes, and safely share an Internet connection among your computers. Already have a computer network? No problem. Call Access Computing now at (607) 937-8546, to set up your shared Internet access. Wireless networks are rapidly becoming more popular and coming down in price. Since they don't require cables, you can use the devices anywhere in an office or home, even out on the patio. There's no need to roll out an Ethernet network cable to each room of a house; you can network anywhere - without wires. Outside of the home, wireless networking is available in hotspots at coffee shops, businesses, airports - great when you're on the road and need to get some work done. For convenience, wireless networking is the answer. Wired networks have been around for years. They use the most affordable products and provide the fastest speeds of transmission. The distance between devices, such as computers, on a network is also much less restricted in wired networking - up to 300 feet with Cat 5 Ethernet cables or 1,800 feet using fiber optics. When you need to move large amounts of data at high speeds, such as professional-quality multimedia, wired networking is the most efficient way to do it.